What if Ali played major league baseball? What if he was in the Topps set you’re trying to get autographed? What if you had gotten a pamphlet like this with the autograph? What if your religion didn’t agree with his? Ali knew the power of autographs. He’d autograph every copy, so fans would keep the handout. If they kept the brochure for the autograph, they might read the contents. Current and former players are giving a gift when they give an autograph by mail. They believe you’re interested in them as people. People have religious, political or other views we don’t agree with. Baseball people will include “extras” in their replies — business cards, brochures or requests to donate to a charity, even though they signed for free. I disagree with someone who sends back a brochure but keeps the autograph. Recycle if the literature offends you. Starting a debate with a signer might create a former signer — or someone who requires a $20 “donation” for their cause for each signature. If the pamphlet seemed annoying, how will you feel knowing that your money is supporting that opposing viewpoint? 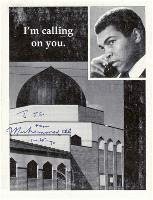 By the way, those tolerant enough to save Ali’s autographed pamphlet should check ebay today. The surviving signed tracts are fetching top dollar. I’m grateful for the image from the fascinating website www.aliautos.net. To learn about the boxing great’s AUTHENTIC signatures, this is the ultimate education!